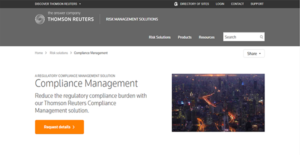 What is Thomson Reuters Compliance? Thomson Reuters Compliance Management Solution is a holistic approach to regulatory compliance and mitigation of risks. It helps you streamline and simplify related processes for you to be able to focus more on enhancing your company’s value for shareholders. With Thomson Reuters Compliance Management Solution, you can meet the challenges brought about by the magnitude and rapidity of compliance regulation changes confidently and effectively. Moreover, you can simplify the roll-out of changes that let your remain compliant with regulations. Though the process can be beset with risks, Thomson Reuters Compliance Management Solution assists you in ensuring that not a single detail slips through the cracks. Thomson Reuters Compliance Management Solution the solution helps you make straightforward the processes related to compliance management. In effect, your shareholders are happier, as you directed more of your attention towards enhancing the organization’s value. Furthermore, you can be more confident in effecting compliance as Thomson Reuters Compliance Management Solution enables you to spend more time in gaining intelligent insights from data analyses and reports. Regulations change from time to time and keeping up with them is not just time-consuming—it can be costly too. However, with Thomson Reuters Compliance Management Solution, both expenses in time and money are reduced. That is because the software helps you stay apace with regulatory modifications with ease. Additionally, you can also alleviate the effects of a missed regulatory change. Thomson Reuters Compliance Management Solution helps you draw an outline of the latest spate of alterations to rules and policies that you can use as a checklist to ensure that no detail is left untouched. Regulatory changes are usually considered as projects that require the keeping of spreadsheets and the utilization of other legacy tools. But employing such approaches can be risky—important details that can jeopardize your compliance and get you penalized may escape your attention. Fortunately, Thomson Reuters Compliance Management Solution enables you to make certain that every change is accounted for in the implementation project. Thus, you can rest assured that your organization is fully compliant with standards. If you are considering Thomson Reuters Compliance it may also be beneficial to investigate other subcategories of Best Compliance Management Software listed in our database of B2B software reviews. Every company is different, and may require a specific Compliance Management Software solution that will be adjusted to their business size, type of clients and employees and even particular industry they cater to. You should not count on finding a perfect solution that will work for every company regardless of their history is. It may be a good idea to read a few Thomson Reuters Compliance reviews first and even then you should pay attention to what the solution is intended to do for your company and your staff. Do you need an easy and intuitive service with only essential features? Will you actually make use of the advanced tools needed by pros and big enterprises? Are there any particular tools that are especially useful for the industry you work in? If you ask yourself these questions it is going to be much easier to locate a solid solution that will fit your budget. How Much Does Thomson Reuters Compliance Cost? Thomson Reuters Compliance Management Solution provides you with a holistic and methodological approach to risk and compliance management. If you wish to learn more about the solution and its enterprise pricing plans, you can get in touch with the sales team via a web form or by phone. We realize that when you make a decision to buy Compliance Management Software it’s important not only to see how experts evaluate it in their reviews, but also to find out if the real people and companies that buy it are actually satisfied with the product. That’s why we’ve created our behavior-based Customer Satisfaction Algorithm™ that gathers customer reviews, comments and Thomson Reuters Compliance reviews across a wide range of social media sites. The data is then presented in an easy to digest form showing how many people had positive and negative experience with Thomson Reuters Compliance. With that information at hand you should be equipped to make an informed buying decision that you won’t regret. What are Thomson Reuters Compliance pricing details? What integrations are available for Thomson Reuters Compliance? If you need more information about Thomson Reuters Compliance or you simply have a question let us know what you need and we’ll forward your request directly to the vendor.